don't like when i miss the original track ! Énorme !!! Dosage parfait entre les styles bien funky et hip hop. Une date prochaine sur Paris? WTF!?! Definitely feel this one! Thanks to suspect, one of the dopest shows so far.. 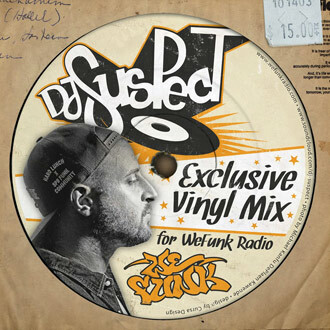 Break loose: DJ Suspect rides the stylus through pounding drums, raw raps and funk tracks by DJ Format, Breakestra, Sinto, Mighty Mocambos, Soundsci, Zajazza and many more. Plus Yasiin Bey's steel pan flows on "Sensei on the Block", blistering street poetry off Guilty Simpson's new Detroit's Son LP, Kenlo's off-kilter casiotone funk "Woogie On", and the Bucktown anthem "Here We Come" from the mighty Boot Camp Clik. DJs & GUESTS DJ Static, Professor Groove, DJ Suspect / RECORDED September 18, 2015 / HOSTING PJ, Mike, Oliver & daduke. You can help too! kardinal offishall feat. bounty killer - sick!